The 35-day government shutdown ended last Friday, January 25, however the damage that was done to the aviation system is incalculable. 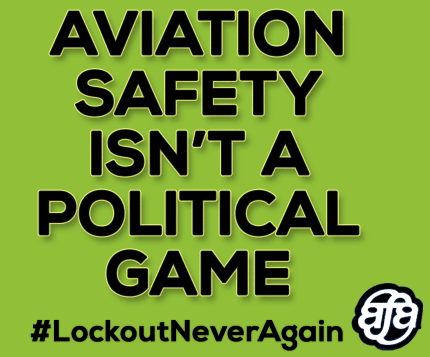 National Air Traffic Controllers Association (NATCA) President Paul Rinaldi said, "We have years to make up." Many air traffic controllers left training or submitted retirement papers. And with the threat of Day 36 of the Lockout looming on February 16, we must remain firmly committed to our strong message to Congress and the White House: We cannot and will not risk another shutdown and lockout of federal workers and the programs that keep us safe. Government is a full set of public services that work together to keep us safe, secure, and our economy moving. There is no partial fix here! We need a fully functioning government and an end to thrusting hard-working, patriotic Americans into the crosshairs of a political game. End this Lockout threat forever. Call your Senators and Representative NOW at (202) 224-2131!